Columbia University is world-renowned for it’s accomplished alumni, rich history and commitment to education and research. But there are many interesting facts that never made it to the headlines. Check them out below! 1. The first class of graduates from Columbia was made up of only five students. 2. The State of New York gave Columbia the 14-acre land that became Rockefeller Center in 1929. In 1985 Columbia sold the land to the Rockefeller family for $400 Million, which doubled the University’s endowment. 3. Columbia University, originally called King’s College, was the fifth of nine colleges originally chartered in the American colonies. 4. Columbia’s medical college was the second medical school ever established in the colonies. In 1770 it became the first to award the M.D. 5. During the British occupation of New York City in 1776, Columbia was used as a British military hospital. 6. The first intercollegiate sporting event Columbia played was a baseball game against NYU in 1860. 7. 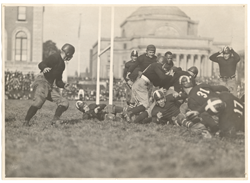 Between 1905 and 1916, Columbia abolished its intercollegiate football program in protest of the game’s violence. 8. The Student Homophile League, the country’s oldest student-run gay rights group, was founded at Columbia in 1966. 9. During the American Revolution, the Battle of Harlem Heights was fought on September 16, 1776 on the land where Columbia University sits today. 10. Dwight D. Eisenhower was Columbia’s 13th president but resigned in 1953 when he was elected president of the United States.